I am pleased to announce the first new book from Dominican Liturgy Publications for the year 2012. 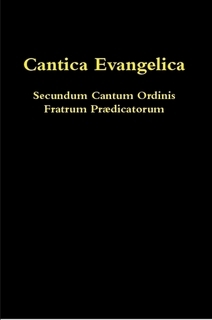 We have just published, in paper, the booklet Cantica Evangelica, which contains fully noted texts for the Gospel Canticles of the Divine Office (Benedictus, Magnificat, Nunc Dimittis) in Dominican Gregorian Chant. The more complex mediationes for the Benedictus and Magnificat make these difficult to site sing. Now the entire texts are supplied with music. Along with these canticles this booklet also contains the Invitatory Psalm "Venite" (Ps 94/95) set to the special Dominican tones. Several of these melodies were previously only available only in the rare 1863 Antiphonarium, where there were deviations from the medieval music. The tones are now corrected and set in traditional style neumes for the first time. May this book make this music better know in our Dominican Houses and among choirs who perform Dominican chant. The order page for this book may be found here.